Boltless shelving is the ultimate workhorse when it comes to industrial shelving. Having the most economical price tag it is found in store rooms and warehouses of every type of company imaginable. 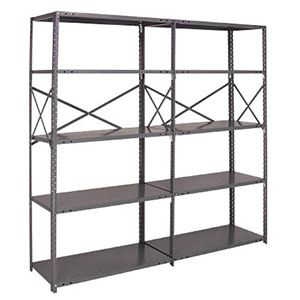 Since boltless shelving does not use back or side sway braces product can be loaded from any direction. Learn More. 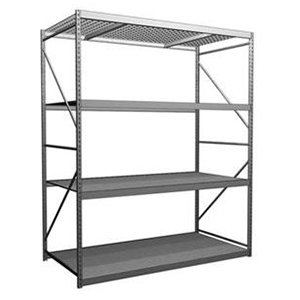 Steel shelving is perfect for storing a large range of items, though is especially suited for small parts storage. Shelves clip into place using compression clips that adjust on 1” centers making for quick shelf adjustments. Units are held ridged utilizing back and side braces. Learn More. 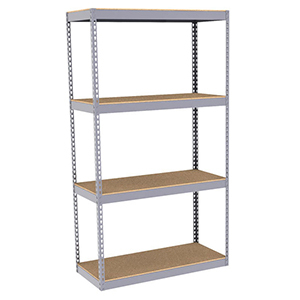 Wire shelving is great where an attractive appearance is needed. 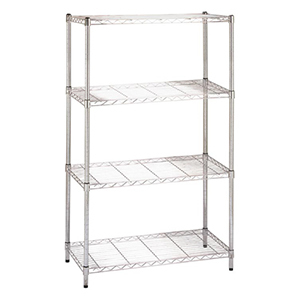 Wire shelving is typically made in a chrome finish, but stainless steel, zinc, and other custom finishes are available. Wire shelving system are very often made into mobile units by adding stem casters and can be customized any number of ways. Learn More. Widespan is the perfect solution for large bulky items. These units are sold in many widths, but 6’, 7’, and 8’ feet being the most popular. With capacities in the 1,000lb – 2,500 range they are perfect large hand stacked items. Learn More.